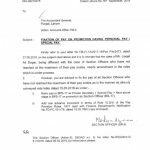 Govt of the Punjab Finance Department has issued Notification No. 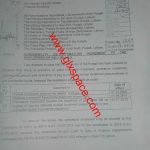 FD.PC.2-2/2012 dated 14th January 2013 regarding admissibility of increments beyond the scope of Pay Scales. According to Finance Department Punjab Notification No. FD.PC.2-1/2005 dated 16-01-2007 wherein it was, inter alia, clarified that all Govt Servants who have exhausted or may exhaust the relevant existing pay scales would be allowed the benefit of annual increment beyond the existing scope of the pay scales wef 01-12-2005 with no retrospective benefit, subject to the condition that the employee concerned has put in six month’s continuous service. The said benefit was to be treated as personal pay. Vide Notification No. FD (PC)10-1/78(Pt-ii) dated 15-07-2011 whereby benefit of notional increment in the year of retirement (having at least six months’ service in the year of retirement) was allowed wef 01-06-2011 with no retrospective benefit. 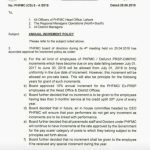 Premature Increment on promotion from lower post to higher post if the concerned civil servant is at the maximum stage of pay scales of higher post. 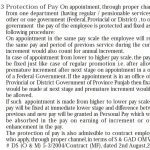 The benefit of annual increment on notional/presumptive basis in the lower pay scale (at the maximum stage) in case of promotion after 1st June and civil servant opts for re-fixation of his pay in terms of Rule-10(3) of Pay Revision Rules 1977. The matter has been considered in the Finance Department and it has been decided that in the above two cases increments if otherwise due may also be allowed beyond the scoping of pay scales. These increments so allowed shall be treated as personal pay. The amount of the personal pay may be treated as part of the pay scale of the concerned government servant for the purpose of fixation of pay, pension and the recovery of House Rent, etc. 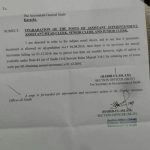 However this concession shall be admissible only to those who shall be promoted on or after 01-01-2013. Any claim pertaining to a period prior to this date shall not be entertained. I am Meritorious Prof. the court appointed me in BS-22 retrospectively with the condition that the service shall be counted towards seniority and pension. I paid pension contribution to The university but they refused increments for those years. Pleas advise if I am entitled for the getting the increment. couple of months a go NTDC directly Appointed !3 Assistant Managers CIVIL ,did you have there appointment Notification or any other details pl share via email. ASA.Sir i an emplyee of agri. water management punjab govt. that i was retired on compulsary retirement i was appointed on 1984 my seniarty and transfer on punjab level but i am working under district govt. that DO penalized me i want to DO is a gopetamt authority or noy how i can research retated laws pleas help me. Dear Muhammad Boota, I am not confirm about this situation. employees retired on 1st September, 2000. I am facining a problem regarding my pay fixation. 1.I was drawing maximum of scale in BS 18 after getting moverover from BS 17 to BS 18. I got four advance increments on accouint of higher qualification after getting the degree in M.Sc Agriculture Engineering in 1997. As I was already drawing maximum pay in BS 18 so my advance increment added separately with my scale as personal pay at the rate of 366 x 4=1464.. When govt, of Pujab revised the pay scales in 2001, my pay was fixes in BS 17 and the 4 advance increments if amounting Rs.1464 not merged in the scale and remained as such with scale BS17. Now I want that my pay should be fixes with merging these increments in the scale BS 18 and then my pay should be fixed in BS17. Please guide me in this matter..
2. When the limit of increments of scales 2001 removed then, was I capable of gettin one incerment on 01.12.2001 as I was getting maximum of scale on 1.12.2001? Dear Nisar Ahmad, in the Revised Pay Scales 2001, it was done that all the increments etc were added and in the previous scales and then it was fixed in the new scales. Your pay should also be fixed in the same way. Hope you would be fine and doing great guns. I would like to have your kind help to kindly guide me about rule position on anomaly. 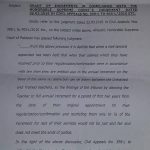 In our department, accounts department are not dealing the anomaly cases of those servants who have acquired qualification increments during service (senior or junior), what is the rule position in this regard, is their any bar on dealing such cases. Sister, if you have any supporting papers in this context, kindly provide me to elaborate the issue in detail. I shall be highly thankful to my sister for ever. in reply of your question i will advice you,please see scale of 1st December 2001. Dear ASIm, the higher qualification completed after 01-12-2001 is not counted for Advance Increments. madam .iwas promoted on 30-05-2006,at which forum i may request for getting premature increment as pb govt has allowed only to those who will be promoted after 1-1-13. Muhammad Tariq you can see anomaly latter of 2006. your problem will be solved. es se kya faida ho ga? Dear Imran is ka yeh faida hoga keh agar aap scale ki last stage per hain aour aap ki same scale promotion wagaira ho jati hay to aap ko Personal Pay (PP) ki shape main increments mil jain gi.